Get ahead of Black Friday and start planning your Camino trip today. 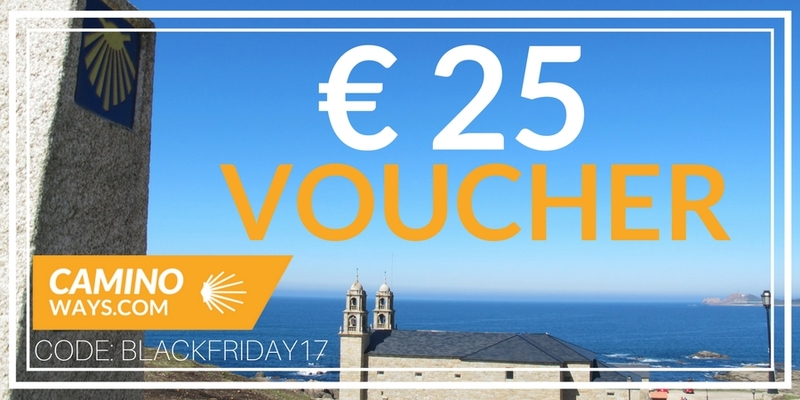 We are giving away €25 OFF per person for bookings made from Friday 17th until Friday 24th November * on all CaminoWays.com and IrelandWays.com self-guided tours. This special Black Friday travel deal can be enjoyed in addition to our 10% OFF Early Bird Offer so don’t miss this opportunity to book your Camino 2018 at a fantastic price. To claim your Black Friday Camino discount quote BLACKFRIDAY17 when booking your Camino trip at caminoways.com. The CaminoWays.com Black Friday travel deal is only available from Friday 17th until Friday 24th November at midnight. A 7-night Camino trip from Sarria to Santiago package includes standard accommodation with breakfast, 5 dinners, luggage transfers and holiday pack with pilgrim passport. Original price €1372 for 2 people sharing, now only €1185 for 2 people sharing / €592.5 per person with our Black Friday and Early Bird discount. Save €187 (€93.5 per person). *Terms and Conditions apply. Black Friday travel deal available for all CaminoWays.com and IrelandWays.com bookings confirmed from 17th-24th November, both days included. Offer is applicable to self-guided tours for bookings of 5 nights minimum. Hi Milvia, thank you for your message. I have sent your enquiry to our travel team who will be in touch with the details of the best options for your Camino trip. Luggage transfers are always included in our tours and work out great if you are planning any long distance walking holiday. Both of the routes that you mention are beautiful with lots of scenic areas and charming towns along the way. Please let us know if you have any other questions. We are always here to help. Kindest regards, Lisa from CaminoWays. Hi We are a family of 6 people thinking of doing a 13 day Camino in July 2018. We were tossing up between the Portugese coastal way or the way of the North? Depending on which one is more scenic ie in more quaint towns and things to see on the way to keep 4 teenagers happy.